Yet another debut novel. Officially my twelfth, so YAY I completed the Debut Author Challenge, though of course I will continue to read debuts as they present themselves to me. The best way to describe Department 19 is a combination of James Bond and Dracula. At the age of 14 Jamie Carpenter watches as his father is gunned down for terrorism. 2 years later he discovers just what kind of group his father was in, and it wasn’t terrorists! Jamie soon meets Frankenstein (yes The Frankenstein) and the descendants of several famous characters from the original Vampire story, Dracula. The mix was so interesting – the mixture of spy thriller and paranormal makes for an action novel that can appeal to all. Just one disclaimer: this novel is extremely violent and gory. More than once I found myself gagging and passing over several paragraphs. So, if you have an easily turned stomach, this is NOT the book for you, no matter how good it sounds. Sorry. 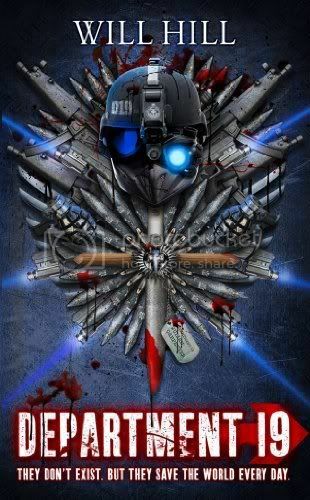 My Review: Summer blockbuster season is in full swing and this is just the latest in a great summer lineup! 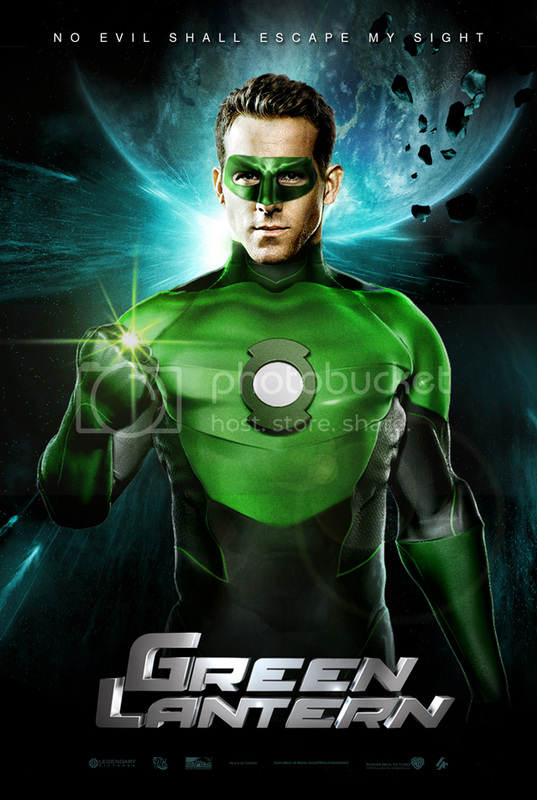 Green Lantern is another superhero film that I knew nothing about before walking in. As you’ve probably figured out I was not allowed comic books as a kid, and they’re fairly difficult to find on the library catalog now. All I knew was what the trailers told us: 1) it’s a superhero with a green ring and 2) Ryan Reynolds is hot. Visually, this is a gorgeously done film. The CGI doesn’t seem fake and the costumes were wonderfully detailed. The world was colorful and beautiful – I almost would watch it again just to see the sets. But the best part for me was the metaphorical implications of the story. For those who don’t know, Green is the color of “will” in this film. Hal is chosen by the Green Lantern ring to wield the power of will, supposedly because he is fearless, and he fights against Hector, representative of Yellow, the color of Fear. I won’t spoil it for you but the significance of the two colors and how events work out is actually a really good moral. Having just seen and loved Thor this one wasn’t quite as impressive – I’m a sucker for stories that are set in the same universe and have little in-jokes in them (Captain America’s shield showing up in both Iron Mans, that type of stuff. I mean, come on, who doesn’t love that? lol). But it is a very well done film, and I’m looking forward to the second film they set up! 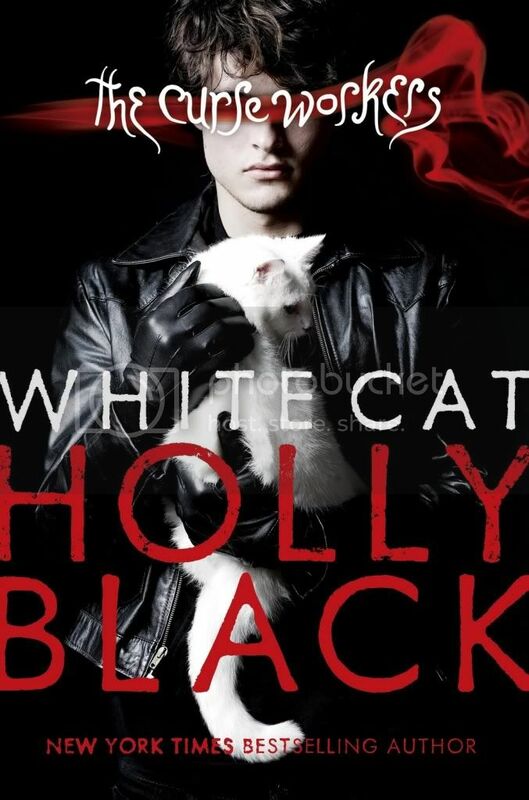 I always seem to forget how unique and entertaining Holly Black’s novels are. I read Tithe and Ironside many years ago and enjoyed them but never got around to reading the rest. Then, after all the hype surrounding Red Glove, I decided I’d better see what all the fuss was. The first thing that really caught my attention on this one was the setting. Cassel comes from a family of “workers” that live to serve their Mob boss overlords. Even though he’s not a worker and isn’t of any use to the crimelords, everything is about the con for him. He even runs a small gambling pool at school to keep his hand in. Holly Black’s edgy style and modern voice fit this setting perfectly, lending to an extremely interesting Urban Fantasy setting. I tend to divide the books I read into 3 categories: ones where I can see the ending a mile off, ones where I can see the ending but have no clue how to get there, and ones where I have no clue what’s going on in the first place. They can all be good reads, depending on how well they’re written, but the first can get boring and the last can be frustrating. The most interesting, and yet probably the hardest to write, is the second of the three, and I would unreservedly put White Cat in that category. I could see what had to happen coming but I had no idea how they were going to make it happen without screwing over the future books. I was amazed every time she revealed a tidbit and several times I had to stop and read a section over again. If you’re still on the fence about reading this book, then I’ll tell you it comes with my highest recommendation. This fantasy is a masterpiece and you won’t regret it! Disclaimer: Some of the facts I’ve told you about the book turn out to be blatant lies. I just couldn’t bring myself to spoil it for you. The opinions on the other hand, are still and will always be 100% truth. Hoping to escape the troubles in her kingdom, Princess Poppy reluctantly agrees to take part in a royal exchange program, whereby young princes and princesses travel to each other's countries in the name of better political alliances—and potential marriages. It's got the makings of a fairy tale—until a hapless servant named Eleanor is tricked by a vengeful fairy godmother into competing with Poppy for the eligible prince. After so many heavy books it is so nice to read one where the fate of the world doesn’t hang in balance! 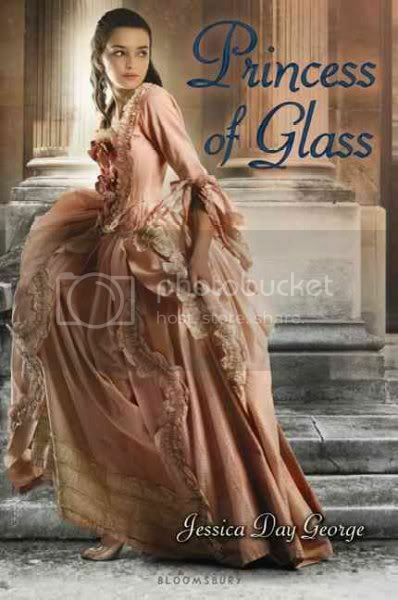 This book is the sequel to Princess of the Midnight Ball (review here) and it follows one of the younger sisters, Poppy as she goes on exchange to repair the damage the curse on her family has done. One of the things I thing George has done wonderfully is keeping the world consistent through both fairytales. She has a very distinctive style that comes through in both. Not only that but there is a strong sense that the stories are related. So many times in retold fairytale series’ even if all the stories are set in the same world, they are only distantly related, a character vaguely referenced from another book, or another book said to be a fairytale from 100 years ago. That’s not the case here. Princess of the Midnight Ball and Princess of Glass are very clearly related both by closeness in time and reuse of characters and themes. Despite the closeness, I found it interesting that she chose to have the actual fairytale happen to a side character. The main characters are all observers with only minor parts to play in the fairytale portion of the story, which makes for a very interesting take on the whole thing. They’re necessary to the main plot, and sometimes the fairytale takes a side plot to their story, but in a way the main characters are all side characters at some point. This is an interesting trick, and kept the story fun and easy to read. Overall I’d say this was a light, sweet retelling of the Cinderella story that’s definitely worth a read! To my wonderful, loyal readers: I am soooo sorry! Just a quick note to say that I am not dead, kidnapped or missing. I’ve been taking some time away from blogging for a while to concentrate on my reading, and it’s doing me a world of good! Also, I’ve been working on my research – remember back in November when I disappeared for a long time because I had a conference to go to? Well, that same research was accepted for presentation in England at the end of July. I’m so excited and so grateful for the opportunity! The only downside is they want the paper to be half as long, which means some major editing needs to happen. (As a sidenote, this NEVER happens to me. In high school I was lucky if I came within half a page of the minimum page requirement! Ergo, this is going to be difficult.) I’d been putting it off because of school, and then because of work, but I can’t put it off anymore. If I’m going to have time for the 5+ drafts it took me to write the d*** thing in the first place, it has to start NOW! In the meantime, because I have been reading up a storm, I do have several reviews almost ready. Starting tomorrow, I’ll be posting them for your viewing pleasure! Thank you all so much for sticking with me through the hard times, and for the wonderful, supportive community you have created. YOU make this all possible! Meanwhile, internecine warfare among vampires is tearing the Downworld community apart, and only Simon — the Daylighter who everyone wants on their side — can decide the outcome; too bad he wants nothing to do with Downworld politics. 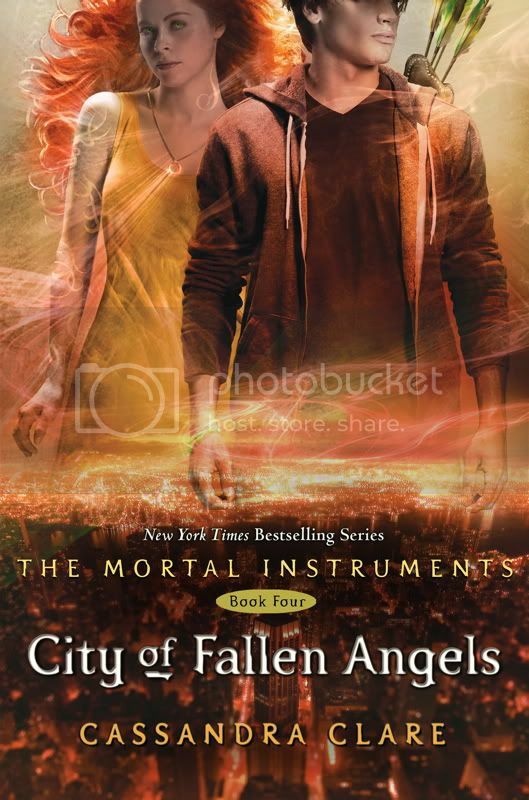 Love, blood, betrayal and revenge: the stakes are higher than ever in City of Fallen Angels. Have you ever had one of those books where everyone loves it and you want to too but you just can’t? I mean, it’s not that I didn’t like the book, I did. I just don’t have a very strong opinion about it either way. I’ve been feeling a little burnt out recently so it may be my fault. No matter what the problem is it’s making it extremely difficult to write a review. Unfortunately, for me, I felt like this was a filler book. This often happens when a series is extended past its original intention (wasn’t TMI supposed to be only 3 books long?) It certainly wasn’t on par with Clockwork Angel, my favorite of hers. Then again even Cassie Clare’s worst book would be better than many authors’ best books, so what am I complaining about, right? All that said, there were some things I really liked about this book. It focused a lot on Simon, who has always been my favorite character. (Jace is too angsty and Clary is too drama-y for me.) I thought that the story did move forward, plot-wise which was the intention, though I don’t feel the characters grew as much as they could have. I guess the bottom line is that this one is essential to the story line so please do read it if you’re into the series. I just didn’t find it quite as good as the rest. Today we are soooo lucky to have Kady Cross, author of The Girl in the Steel Corset with us for a this or that list with our favorite characters! This post is provided as part of a Teen Book Scene blog tour. For a full schedule of events on this tour click here. 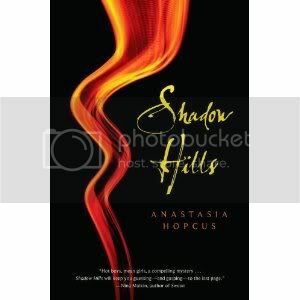 For my glowing review, and why this is possibly one of my favorite books of 2011 so far, click here. Jack: lol — Jack would prefer to remain indoors! 5) Is the glass half empty or half full? 6) Would you rather die in a fight, or of a disease? 7) Would you rather go blind, or go deaf? 8) Maths and science or liberal arts? 9) Do you believe in fate or coincidence? 11) Right or Left Handed? 12) Nerd or bad boy? 13) Blond/blue eyes, or tall dark and handsome? Finley: Does dark and handsome include reddish brown hair and gray/blue eyes? So very interesting! Thank you to Kady for visiting today! Origins: This review is provided as part of a Teen Book Scene blog tour. The full schedule of reviews and guest posts can be found on this page. Summary: [from GoodReads] Sunny has a gift that she has no idea how to use, until she meets Leif, a boy from the kingdom of Acadia, on the other side of the shadows. Leif teaches Sunny about Shadow Walkers and how to use her new found gifts. As they grow closer and their gifts grow stronger, a threat arrives. The Shadow Guard has been sent to bring Sunny back to Acadia, to determine if she is a threat to the king as the rightful ruler of Acadia. As Leif and Sunny prepare to defend themselves, Sunny finds that Leif has also been sent to bring Sunny back to the kingdom but for very different reasons. As a battle for possession of Sunny wages, she is struggling to come to turns with her feelings of inadequacy regarding controlling her gifts as well as the hurt regarding the lies and deceit of everyone around her. My Review: Shadow Dancer is the most recent in a long line of YA paranormal novels on my TBR pile. In many places it reminded me very strongly of Twilight while in others it reminded me more of The Mortal Instruments or Paranormalcy. But, I really appreciate the mixture of things. It’s almost like a collage in art – sometimes putting pieces together in a new way can make something really beautiful. I’ll be honest, at times this really wasn’t my thing. I was very close to putting it down several times because I was having difficulty getting through the style. I felt like Rene would occasionally go off on tangents that detracted from the emotion of the scene, or that were just irrelevant. I am glad I stuck with it though, because it really wasn’t that bad of a book. Once you get past the occasional tangent the story itself is fairly interesting. I found myself curious about the mythology Rene sets up behind the story and I was indignant right along with Sunny when she finds out she’s been lied to. Overall, I’d say this is a decent read. Give it a chance if you choose to read it though, as it may take some getting used to. Today we have Courtney Rene, author of Shadow Dancer here as part of her tour with Teen Book Scene. For a full schedule of posts and reviews please visit this page. 1. What would you like your readers to know about you before reading your book? falling off the fourth row of bleachers at a softball game. Ah yes, that’s my life. my room and covered every flat surface. I couldn’t get enough. I also had a thing for V.C. they be? I just had an aversion to happily-ever-after for some reason. the above, it would Stephen King, as he was my favorite for a long time. 4. What advice do you have for aspiring young writers? or the structure. Just write it. After you have that, then go back and worry about all the rest. the best story you can, take care of the rest later. 5. What’s next for you, after Shadow Dancer? posting it on my website and blog and anywhere else I can squeeze it in. know, I loath that part. As soon as I can get through revisions, I will see what I can do with it. is a graduate and member of the Institute of Children’s Literature. Interested in my review of the book? It’ll be up on the 8th!